I have mentioned before, numerous times, how much I value the Miniature Monthly patreon course. 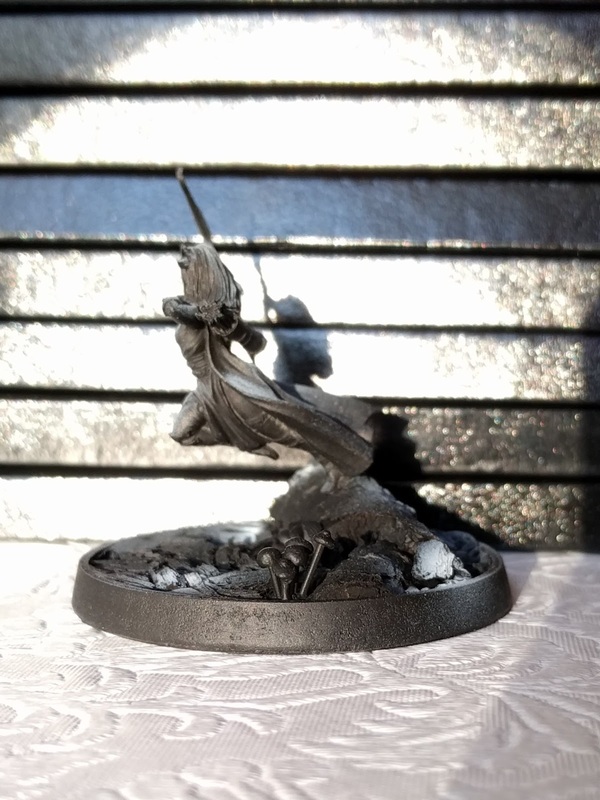 I have worked through a lot of their videos and been applying the techniques I have been learning to up my mini painting game. 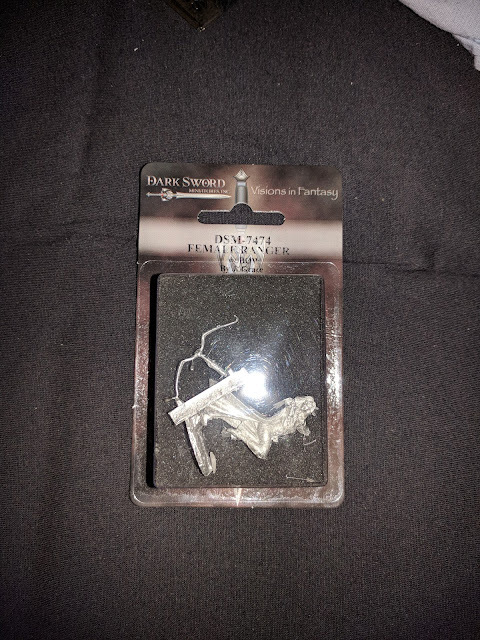 Of course when they announced a mini painting contest, I was all in. 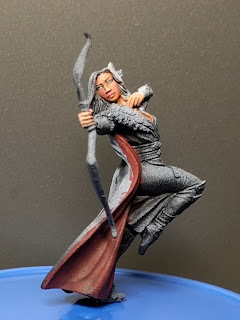 I love the sculpt of the miniature but I have to admit I struggled a little with inspiration for the piece. I ended up going for something fairly simple but still something that would push me personally. 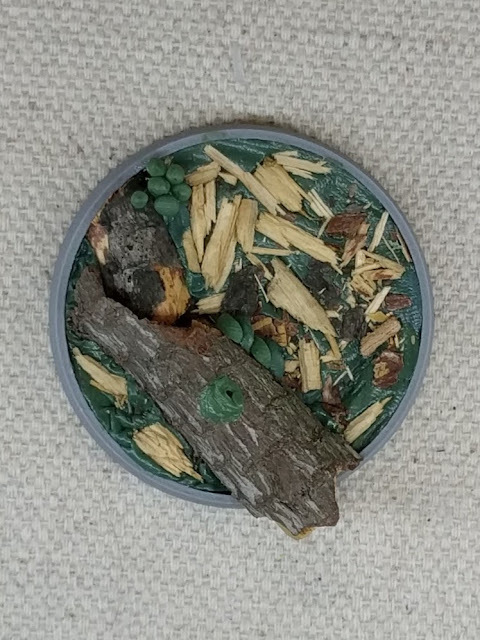 I've never been a big fan of dioramas or fancy basing as I like to be able to use my minis at the end of the day whether it's in a boardgame / wargame or an RPG. Even my favorite competition piece to date (the Librarian) is on a reasonable sized based and could still function in an RPG. I have heard criticisms of Dark Sword miniatures for the 'pastie armour' style that most of their female minis tend to have. 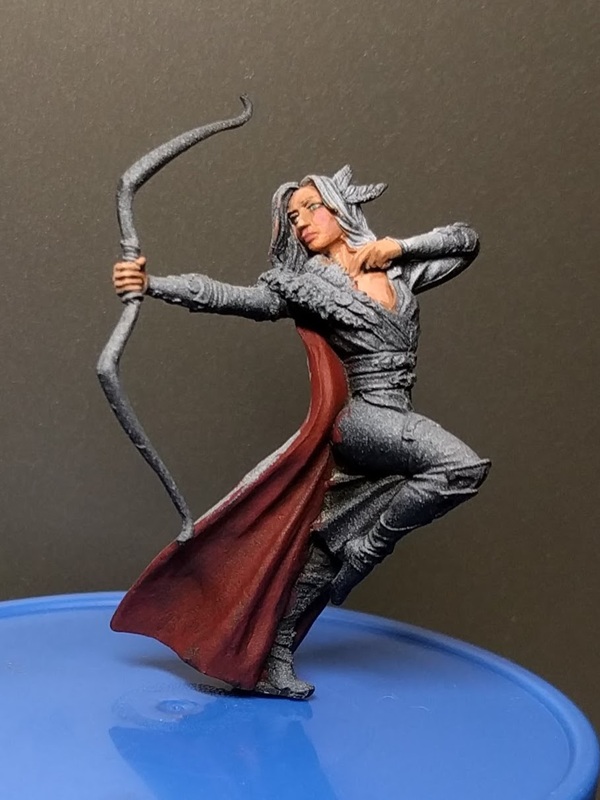 This model isn't nearly as bad as some, and looking at the recent sculpts, it does seem as if they are toning down this aspect of their line. Personally I have no problem with barely clothed minis of any gender - I do however notice a lack of decent female minis in realistic clothing - especially in a fantasy / historic setting and I am glad that Dark Sword seem to be addressing this - this model being a great example. Getting the model out of the packaging, it was clearly a quality cast. The flash was long, clean and easily removed. 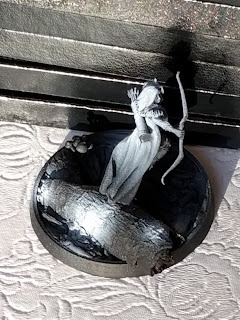 The bow is the major problem from my perspective as it is clearly fragile however, realistically, there is little that can be done to address this and keep the model realistically in scale. The assembly points were clean and green stuff/pinning wasn't really needed (although I did add pins as the modifications for the diorama required it). My biggest bugbear with the piece is the base - I appreciate these are more artistic pieces than functional game minis, but including a plastic base wouldn't break the bank. The rules of the competition made it clear that it was pretty no holds barred - dioramas, other models, anything will work as long as the Ranger model is included. This was a bit alarming to me. 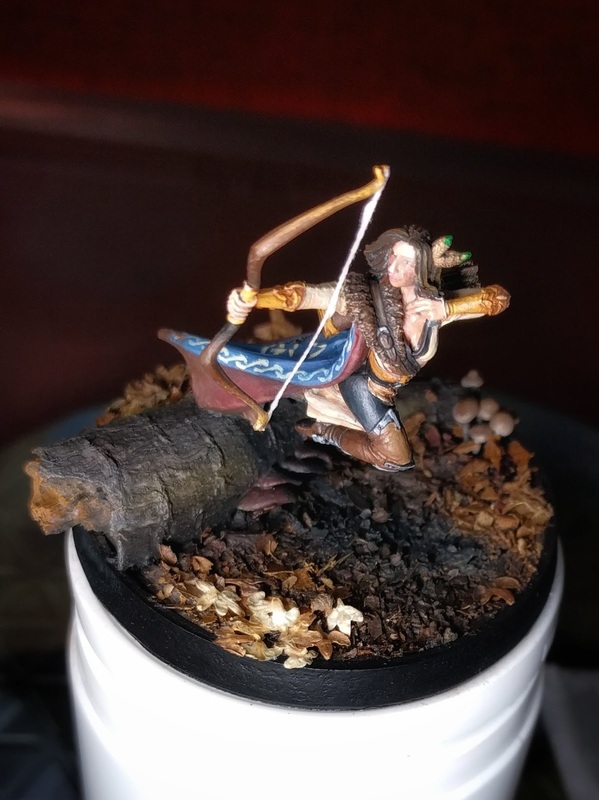 I knew I wasn't going to be one of the more exciting / larger pieces and so I ended up having to hope that the judges would appreciate the focus on the miniature. At the same time, I knew my skill wasn't at a level that I'd be able to just do the mini out of the box and really make it shine so I figured I'd take a middle road - an ornate base but something that could still function as a model for an RPG PC or something. I also wanted to push myself with something new and for that I decided on a woodland scene. 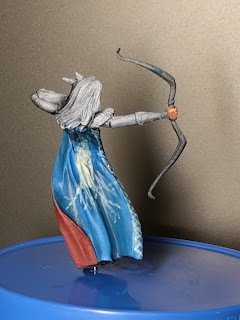 This is not the most creative option, and I have already seen a post on the Miniature Monthly Discord channel of a much more awesome diorama idea than I had. On the other hand, a forest is a natural environment to find a ranger so it feels right to do this. I have never really tried to do a woodland base so it will be a great learning experience as well. I also have the benefit of being back in California to start this model where I can tap the knowledge of Seth Amsden who happens to be the manager of my FLGS out there. Unfortunately, with all the travelling, there was a lot of begging, borrowing and stealing as I didn't have all my supplies with me. Seth's first piece of advice was to tell a story in the base. 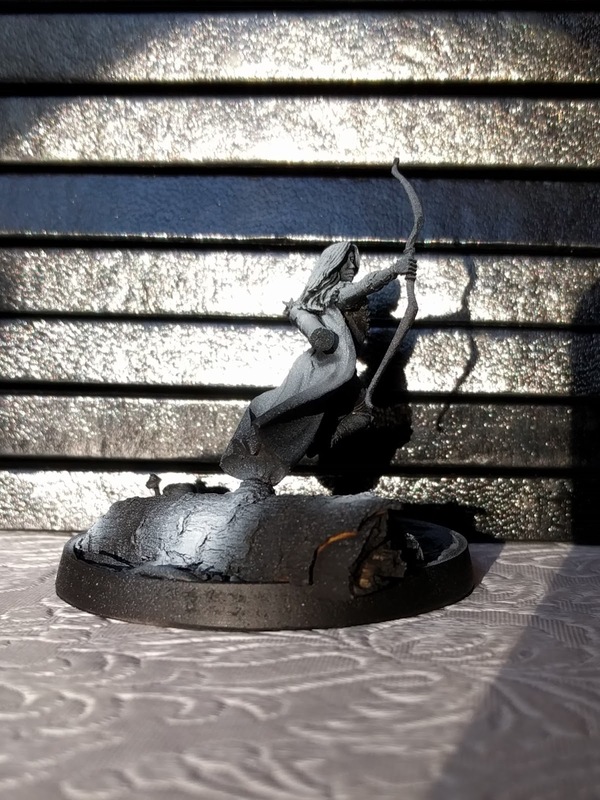 From first seeing the sculpt, I knew I wanted this ranger to be leaping from a fallen log and I knew I'd be using a twig. 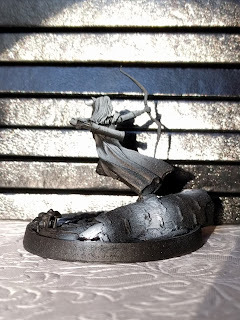 The interesting thing about that is getting a twig of the right size is surprisingly hard for a 28mm scale mini as you want something a little bigger than most twigs but slightly smaller than a branch. I found the perfect thing on a walk out one evening that was even nicely rotted to help with carving out the excess so it would sit nicely in the green stuff. The twig starts the story of this forest -what is the type of wood that our ranger is running through? I'd had in my mind Henry Cowell state park and to that end the Coast Live Oak I had picked up fitted in perfectly. Having embedded it the next step was to get the fungi placed and position the model on the base. This brings us back to the story of the forest - moulds grow in the shadier parts of woodlands so you need to start thinking about the path of the sun. Having primed the model and applied some spot highlights for the dappled lighting. I am still not sure how this is all going to come out, especially as there is so much layering still to go. This is going to be a case of one step at a time, but with a rather limited timeframe to work in. Normally I’d want to do a full test piece to see what everything would look like in the end (see the flooring for my Librarian piece). In this case, I don’t really have the time to make this happen. Things like the wet layer, I am very keen to test as water effects are something I have never touched before. Having laid the foundations, it was time to build up the story of this particular woodland. Geology is big on sedimentary layers and making a woodland scene is an example of this in action. The old soil is the base level that you are going to witness, you then need to build up through the older leaf matter to the freshly fallen leaves. The first thing was to get some base coating in. The underlying texture that I used for the base is pretty course and I knew I'd have to mask a lot of this to make things look realistic. If you're wondering what those brighter patches are... then I clearly didn't do a very good job! The intention is to provide some dappled lighting on the base. This will come back a little more prominently later. By now, I was starting to run out of time for the contest and, unfortunately, the result is not a lot of pictures for the next few stages. Over the base of earth, I needed a damp layer of recent rainfall - the coastal forests of Central California are not prone to heavy rains but will often see some downpours in the Autumn/Fall. 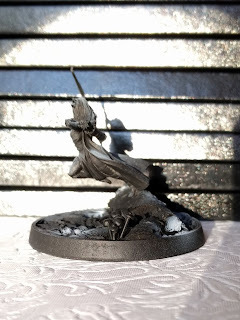 I experimented with PVA and gloss varnish for the shiny finish but ultimately opted for Secret Weapon's Realistic Water with some Army Painter Oak brown mixed in along with ground up oregano that had been stained various earthy shades. I think what I was attempting to do here really was a mistake given the time I had to work in and the fact that I'd never attempted water effects before. It's hard to really clarify what I mean by this without having photos but basically the result seemed to be a glossy paint rather than a wet mud look that I was hoping for. I think I needed to use more actual grit than leafy matter to help it mix into the water and texture it properly. This wasn't possible as I am still missing a lot of my equipment in shipping - particularly my sands. By this point, a lot of my planning had gone awry. A new dog to house train and having to travel for a funeral annihilated the time I had budgeted to finish the project and left me scrambling to pull things together. I'd originally hoped to pick up some leaf stamps from Green Stuff World, but time just didn't allow for it. I specifically wanted to use oak leaves to align with the story I'd been building. It got to Christmas and there just wasn't time. Fortunately for me, a member of the Hobby Hangouts group on Facebook responded to my plea and sold me a bag of maple leaves through his eBay store and got them mailed to the hotel I was staying at so I could finish my piece. As you can see, the dappled lighting didn't really convey too well (more on this later) but otherwise I am pretty damn happy with how this came out. I am so glad that the tree trunk looks as good as if I'd never painted it - I'd hesitated over painting it but one of my painting tutors had pointed out that it's kinda cheating on one level and on another level it means it will never match the rest of the piece. 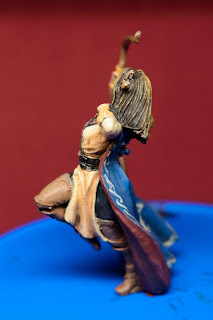 So I've just blathered on about the base and yet the focus of this piece - the model itself - has barely been mentioned! What gives? Well... in all honesty, much as I love the sculpt, I struggled to really motivate myself to put paint to it. With the base, I had a very clear design in mind. I didn't have a particular use in mind for the model nor a source reference to inspire me. One of the things I decided on was to have the figure mostly back lit, this isn't something that ended up conveying itself in the finished piece (insert 'Needs more contrast' feedback here). 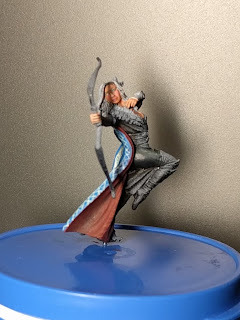 The woods are always going to be on the darker side so I was conscious of this when applying the zenithal highlights. 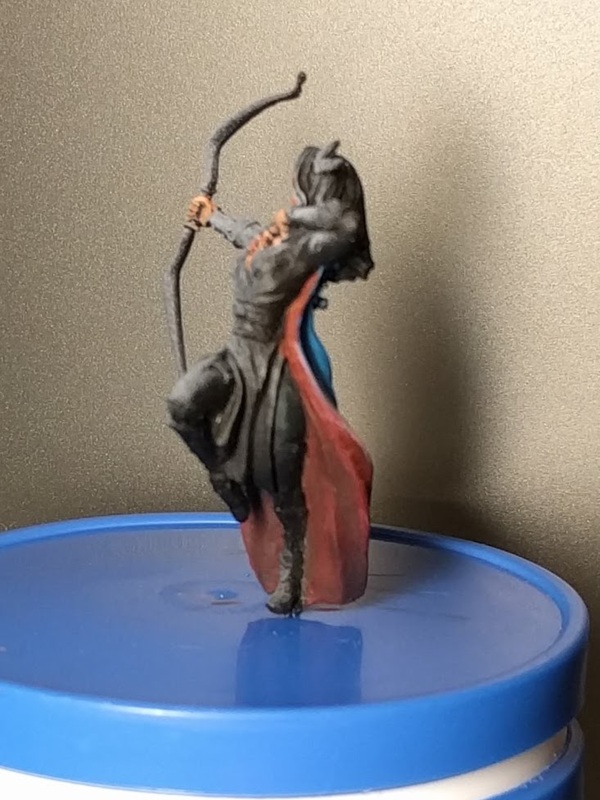 As with all my pieces - first stop was to do the flesh, the sculpt is glorious, everything is just right and easy to paint. I did a fairly simple flesh to begin with but got a little more adventurous in later stages with harsher shading and more tones in with the flesh. 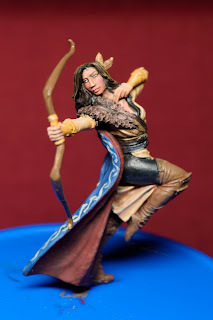 As a forest dweller, she is probably not going to be super tan but I am a little tired of the delicate, pale flower skin tones for women and wanted something that conveyed the strength the model as a whole gives off. 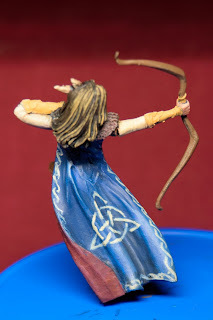 In the end, I painted over the cloak and added a new design. A slightly modified triquetra seemed to fit a little better for the space available. I added a bit of braiding around the edge to fill it a little more. Unfortunately I had darkened the cloak in the repainting and neglected to brighten it back up leaving the piece darker than I'd intended. As the other basecoats went down, I noticed that the upper thigh looked as if it was really meant to be flesh. As mentioned earlier, I am a little tired of the 'chainmail bikini' line of women models and if you are running though the woods fighting orcs and goblins... thigh-highs and a loin cloth is really not the practical clothing option sooo leggings it is. I wanted them to be black with some sheen and getting the paint down for this sheen was a real challenge. I am still not sure it worked but it was interesting to experiment. If you look on the inside of the cloak you can see a little texturing there. This is something I am keen to develop. It started with the Tank paint-a-long where Miniature Monthly give some demonstrations and I feel it really adds a lot to the model. 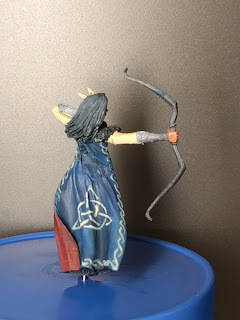 Leather and courser fabrics are great places to really work on this and the cloak here (and some of the leather straps) gave me an opportunity to try it on a smaller piece. I'm pretty pleased with this model. I know that I am lacking contrast - you can see this on the bracket fungus that had started out as a vivid red but been toned down over and over until it barely registers, same with the enoki style mushrooms and the blue cloak. This is another hark back to the 'needs more contrast' issue which I see as my major weakness at the moment.